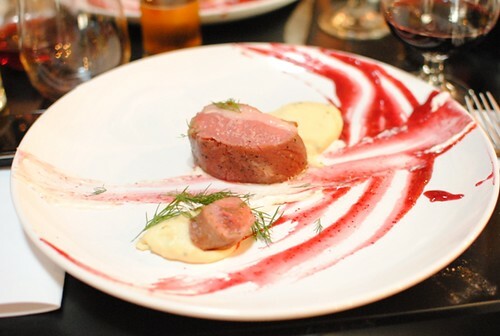 I first went to a Wolvesmouth dinner in January and have been itching to return. Unfortunately, I haven’t been able to – it continues to get more and more popular and, thus, seats are even harder to come by. 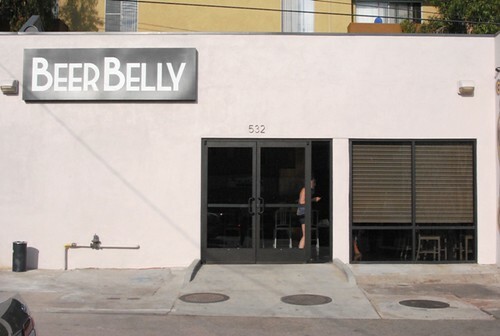 As a way to reach more people, Wolvesmouth (Craig Thornton) and team did a one-night dinner at new Koreatown bar Beer Belly. It’s an ideal match – the bar is closed Tuesdays (i.e. 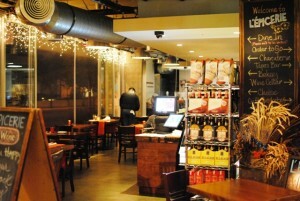 an available kitchen), and there’s plenty of brews to pair with the food. 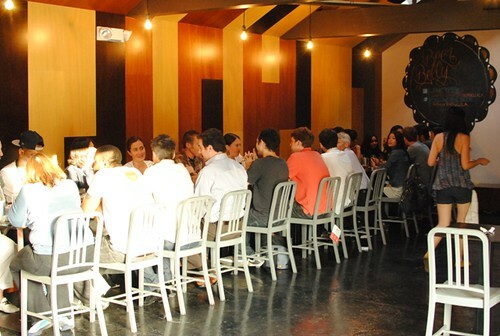 The set-up: two seatings of 28 people each sold first-come, first-served online; 6 courses for $50. 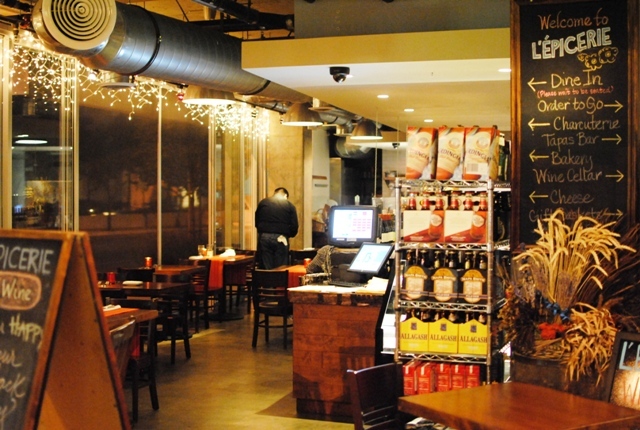 In addition to the beers offered at the bar, a unique set-up wherein wines purchased from Domaine LA were discounted and delivered straight to the bar, waiting upon arrival. Pretty sweet. 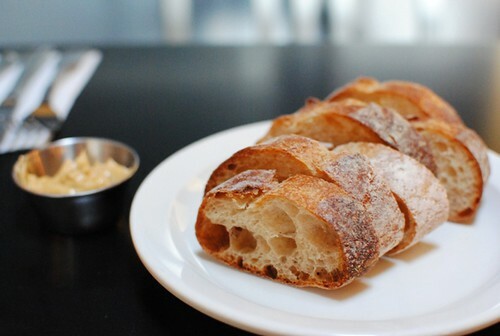 Bread from Bread Lounge started off the meal, as well as a barley malt butter. I do not hesitate in saying this was the best corn soup I’ve had. Probably the best corn-centric dish I’ve had. Seriously. 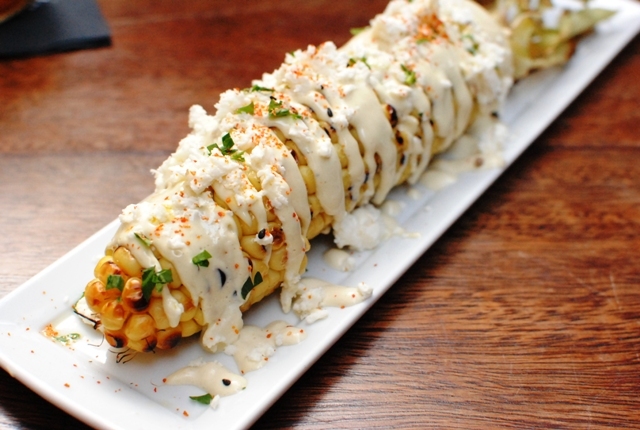 The corn lent a mild sweetness, as did the crab. 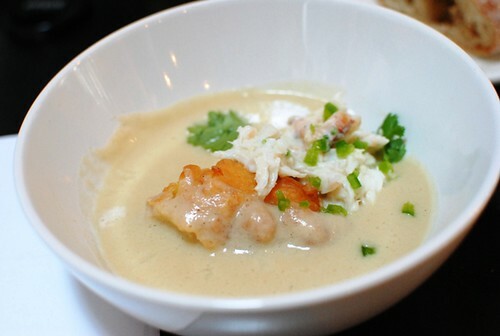 The lime, paired with the crab, really elevated the dish for me by adding some light acidity – a perfect complement to the creamy corn soup. Really well-balanced, for sure. I had heard rumors of this dish and was really looking forward to it. For a six-course meal at $50, I wasn’t sure this could really be pulled in. The rice was al dente, while the onions gave a slightly acidic taste to it. The risotto itself was executed well. The truffle flavor was fairly subtle; if anything, I would have preferred to pay a little more for some additional truffle flavor to bring it to the forefront. 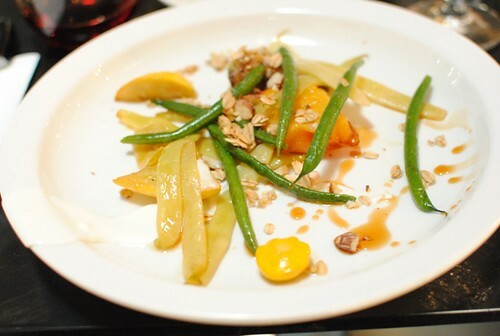 Craig made it a point to note these were not French haricot verts; rather lesser-known blue lake beans. These had a buttery flavor; all of the vegetables were warm, contrasting the cool fruit. Speaking of fruit, the peach was notably juicy and delicious. I thought the tart yogurt did a good job of counteracting the sweetness inherent in the fruit, while the granola added a sweet, earthy flavor. 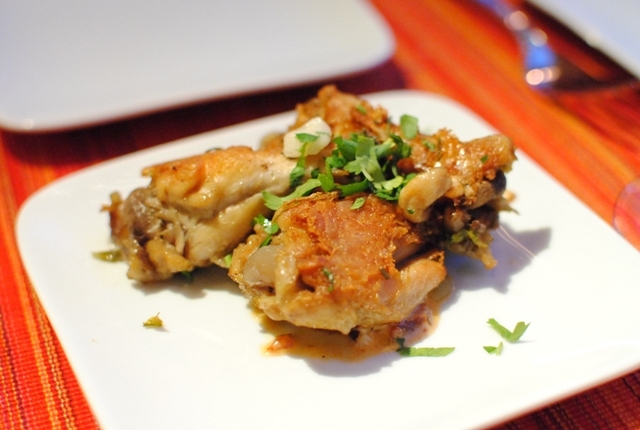 Maybe the most anticipated dish of the evening – this did not disappoint. The lamb was very tender (cooked rare/medium-rare) and not at all gamey, while the horseradish and lingonberry added a spicy and sweet accompaniment, respectively. 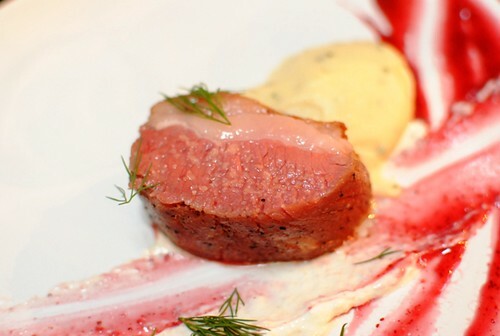 The potato puree was excellent as well, with a little bit of a tart note (creme fraiche or sour cream added?). This tasted exactly as advertised, with just a little sweetness. 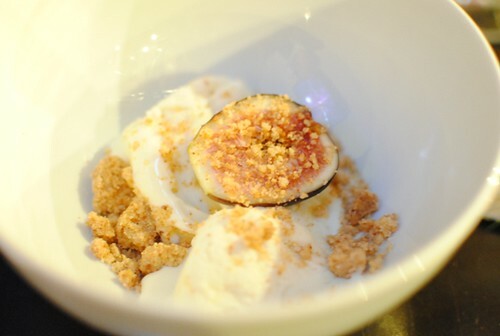 I thought this was pretty tasty with the crunch of the brown butter shortbread, while the fig added a slightly sweet, fresh flavor. I was disappointed for this dish to come since I didn’t want the meal to end. 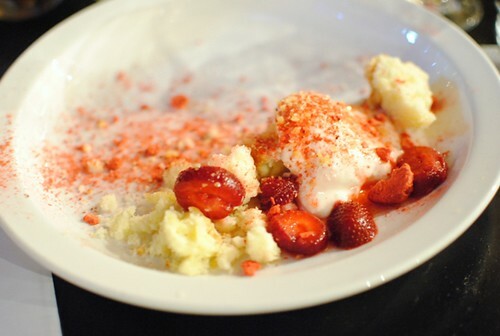 The pound cake soaked up much of the sweet strawberry juice, working well with the mildly sweet panna cotta. A little bit of pop rocks added an extra fun texture to the dish. This dinner exceeded expectations. I try not to rave about a meal unless absolutely warranted, but I really liked this one. I was afraid that maybe it would be a “diluted” version of Wolvesmouth for the masses, but it wasn’t. It was true to the Wolvesmouth style, just abbreviated to six courses. Perhaps not quite as creative as my last meal, but I didn’t mind (the restraint was welcome). 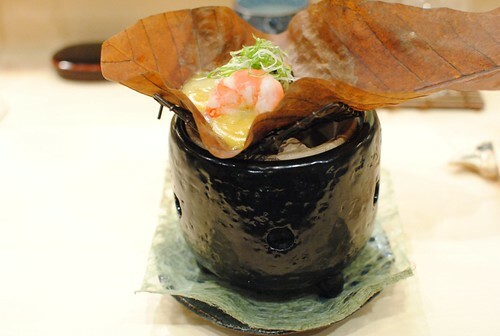 It was unique enough, executed well and quite delicious – again, I’m already craving a return visit. 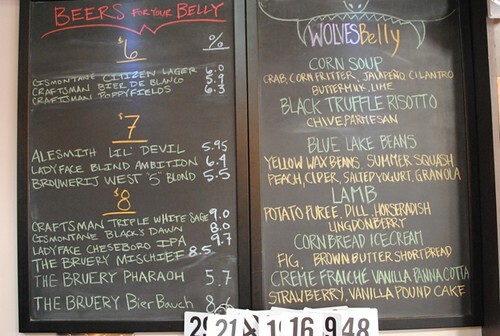 Given the success, I wouldn’t be surprised if this is just the first of many Wolvesmouth meals at Beer Belly. L’Epicerie opened in December, a French restaurant/marketplace in Culver City from Thierry Perez (Fraiche). 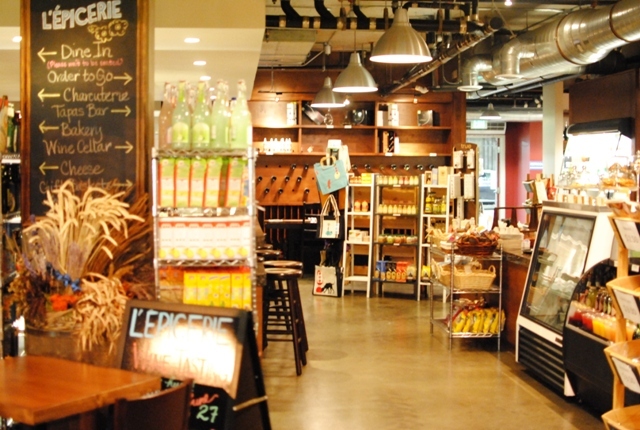 There’s a little bit of everything on offer in the marketplace, from wine & cheese, to oils and vinegars, charcuterie, and pre-made meals. On the restaurant side, the food is rustic French. Just three months ago, a chef change brought in Sébastien Archambault to redesign the menu. 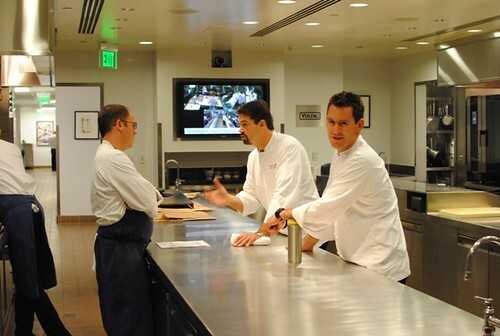 Archambault was previously cooking at RH at the Andaz where he garnered pretty strong reviews. 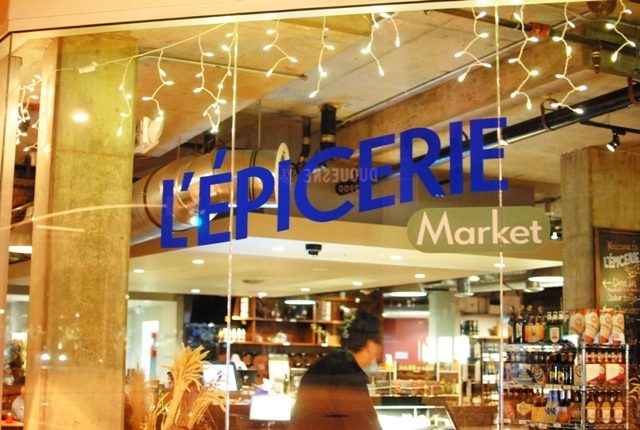 I never made it out there, but an invitation to L’Epicerie would be the perfect opportunity to try some of his cuisine. Yummy. 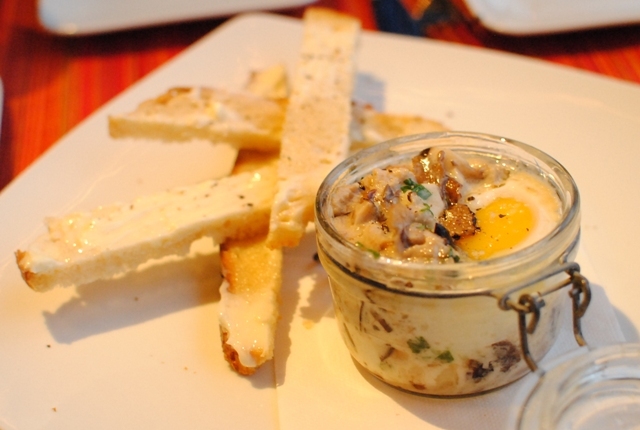 The mushrooms were tender and tasty, while the runny egg added a nice richness and creaminess to pair with the crusty, buttered bread. 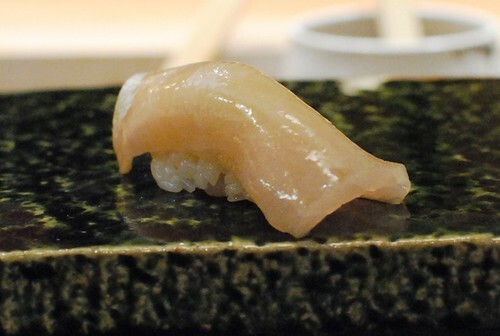 The tongue was really tender, with that distinctive ‘tongue’ flavor. A little bit of heat in the sauce made things a little more interesting, but the beef itself was delicious. Nothing too special about these wings, but they were good. I had to order this given the description. 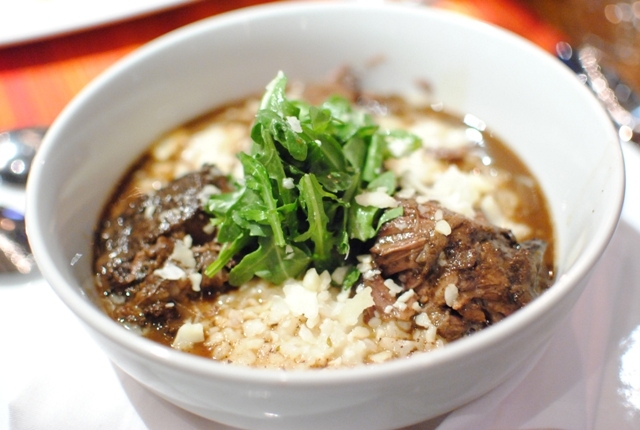 Braised beef cheeks over risotto? Sold. The beef was extremely tender, rich and flavorful. 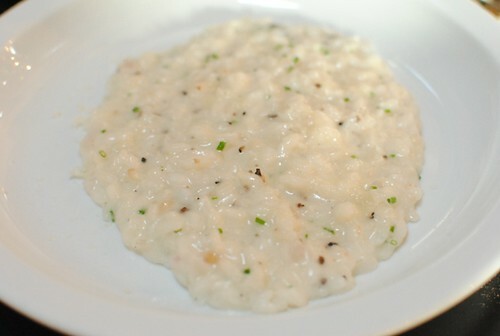 I liked the risotto as well, though I found the parmesan to be a little strong. Still, very comfortable flavors that mixed well. The pork was tender and moist, though not overly so. It was cooked a nice medium, but just wasn’t quite as memorable as our other entrees. 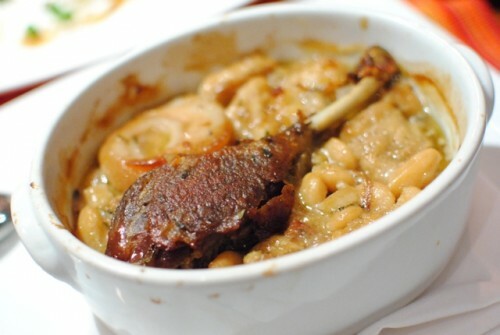 I liked the crispy duck, as well as the rich creaminess of the white beans. The pork belly was deliciously tender as well. A really savory, hearty dish. Finally, we split one dessert. I was glad this was rather light (given all the food prior), with a bright citrus flavor from orange rind and the Grand Marnier. This meal exceeded expectations. The marketplace is rather unassuming, but the food coming out of the kitchen was actually very good. 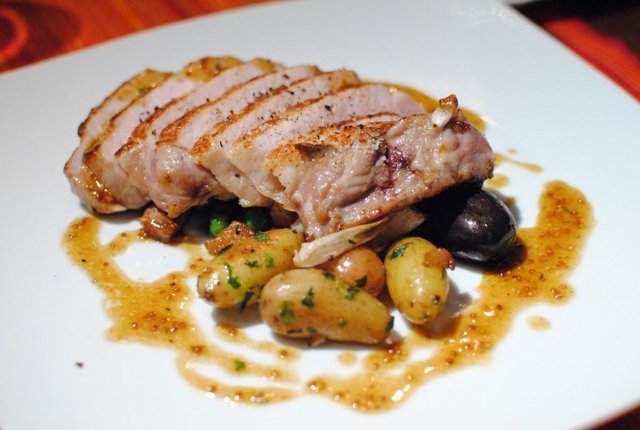 For the most part, the menu stays within a comfort zone of French classics and does them well. I found it to be very comforting and sort of homey, and quite tasty. Note: This was a sponsored meal. Picca has been a long time coming. 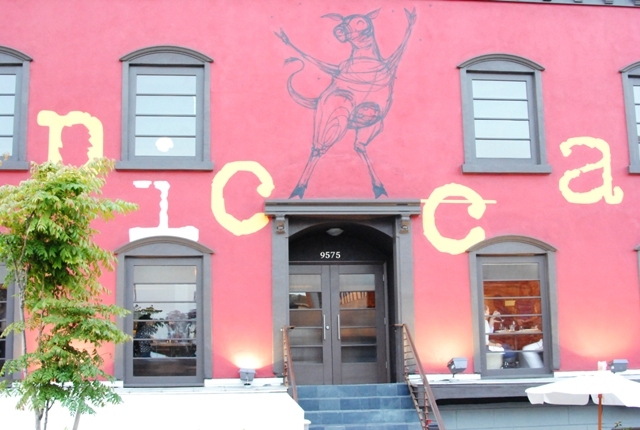 Ever since Test Kitchen closed its doors, we’ve been waiting for Sotto (downstairs, opened March) and Picca (upstairs). 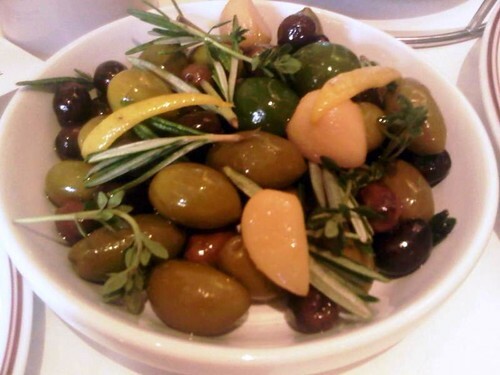 Although Picca’s grand opening is technically Saturday the 25th, there have been a number of preview dinners this week. I attended one of the “Test Kitchen” previews. Ricardo Zarate is the chef behind Picca, popularly known for the restaurant Mo-Chica and for being named a 2011 Food & Wine Best New Chef. I’m pretty familiar with his cuisine, between a number of visits to Mo Chica and samplings of his food at Test Kitchen and various food festivals, so I’ve been eagerly awaiting this opening. 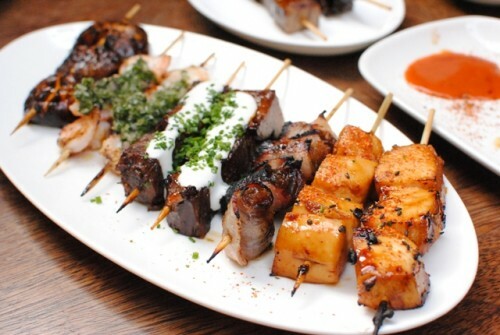 The menu is split into five sections: appetizers, causa sushi/ceviche/tiraditos, anticuchos, entrees and desserts. 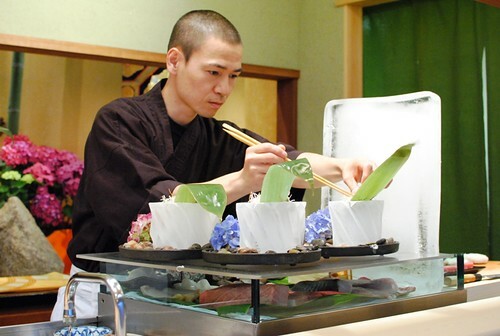 During this preview, we selected one from each to create our own customized five-course meal. As with all of the other Test Kitchen sister-restaurants, Julian Cox is the man behind the bar. 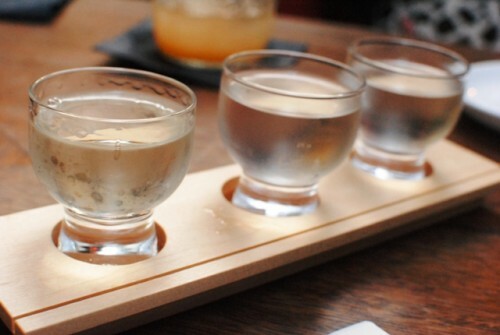 Here, the cocktails feature pisco, a brandy-like alcohol from Peru. Ginger and anise flavors help balance the alcohol in this drink, with a nice mint flavor towards the end. 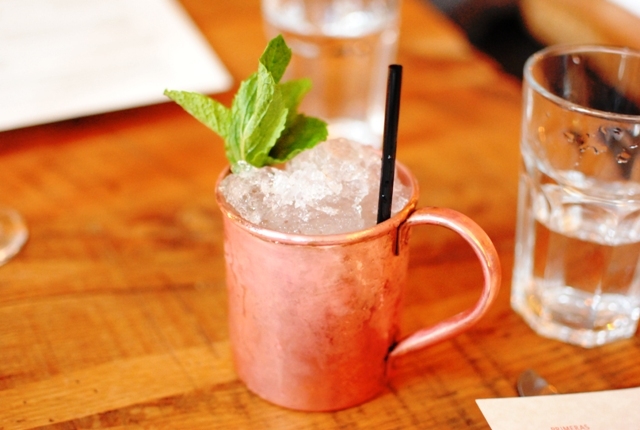 Loved the copper cup. 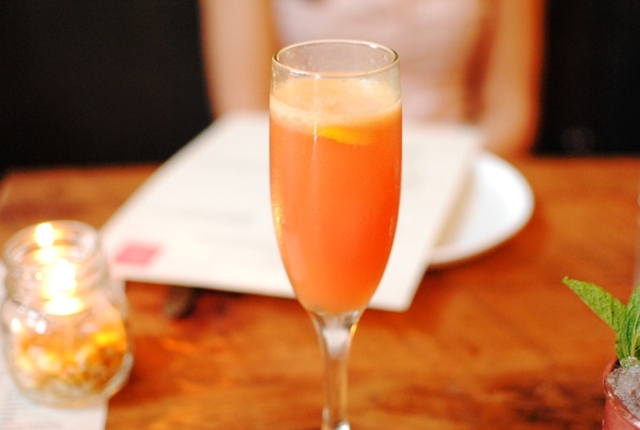 Kind of like a kicked-up mimosa. Fruity and citrus notes from the passion fruit and lemon juice balanced the cava and pisco. Tuna tartare is a little played out in my mind. However, there was something about this version that really piqued my interest. 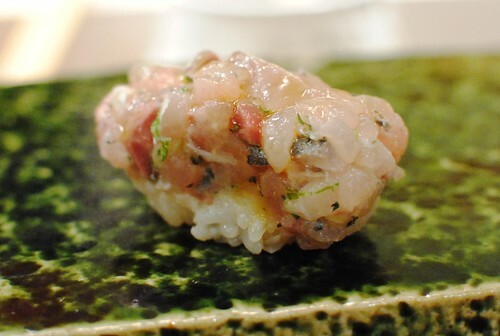 The tuna was good, and there was a touch of wasabi for some heat. 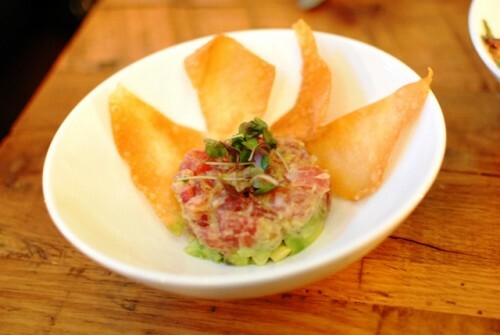 The wonton chips were a good way to get some light texture into the mix. 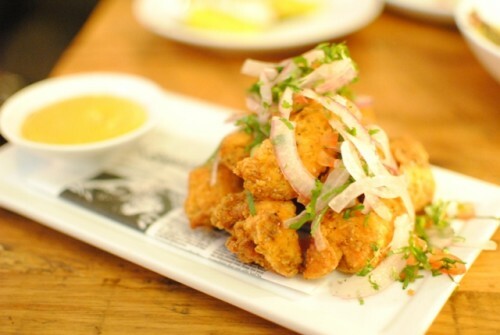 Pieces of marinated chicken breast were fried up and topped with a salsa. The chicken wasn’t dry at all, though it did not have a ton of flavor. The bulk of the flavor came from the fresh salsa, as well as the sweet rocoto sauce. 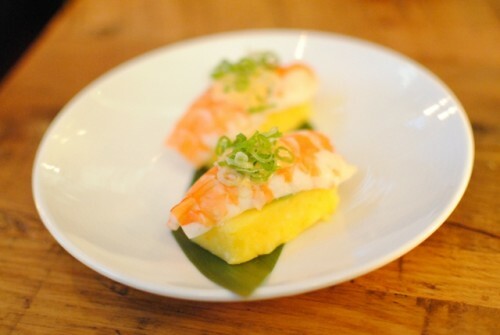 Zarate’s play on nigiri sushi are these causa sushi. 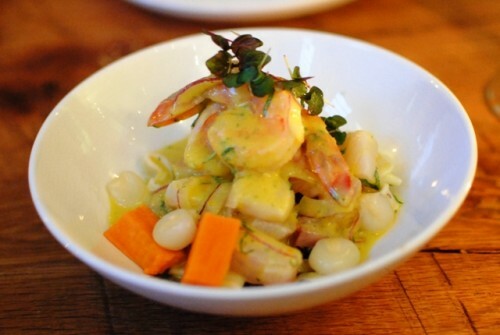 Instead of rice, a soft and creamy potato is the base for all sorts of seafood – here, shrimp. Accented by some bright yuzu kosho, I thought this was really tasty. 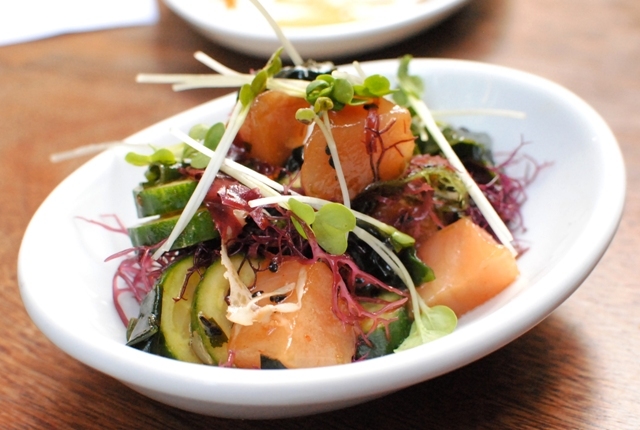 This ceviche is pretty similar to the version at Mo-Chica. Given all the accolades that this dish has won, I’m glad Zarate has kept it true to his original. 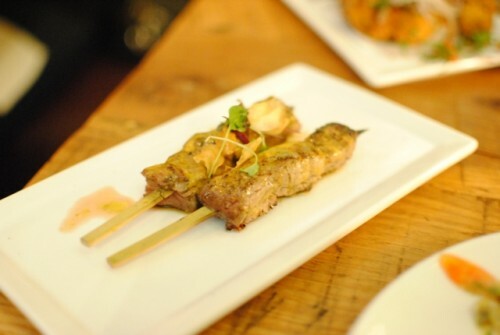 Chunks of fresh sea bass, scallops, squid and shrimp are mixed up with onions and sweet potato in a citrusy marinade. Really delicious. The sea urchin butter really elevated this dish. The beef was tender and juicy, very good on its own. 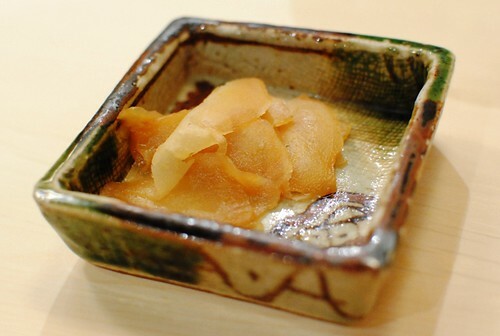 But the sea urchin butter added a little more richness and depth of flavor…really nice. This was a must order for me, and it didn’t disappoint. 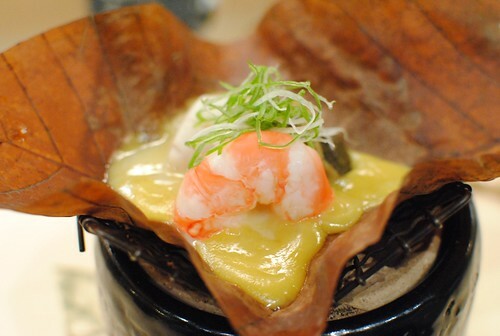 It’s a rather simple dish, allowing the prawn to stand out. 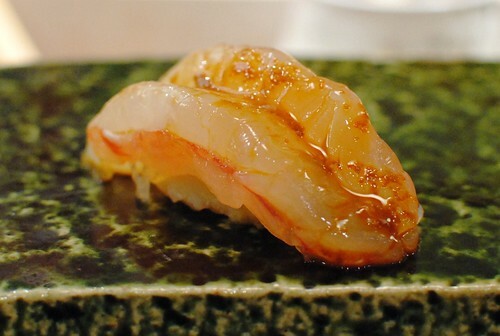 Lightly cooked, the prawn was very moist, sweet and tender. A little bit of lime juice was perfect. The seafood was cooked well, my favorite were the plump mussels. 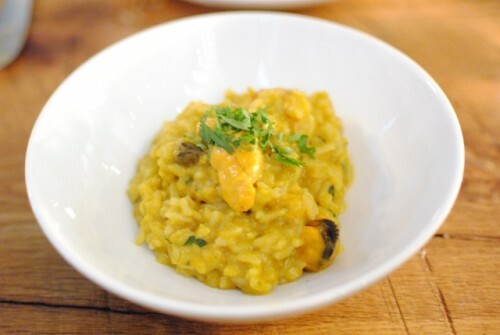 The rice was really rich and flavorful, with a definite seafood flavor to it. One of my favorite dishes at Mo-Chica is the braised oxtail, so this was something else I wanted to try. I thought the flavors were on point, with a little bit of fresh acidity from a salsa topping. 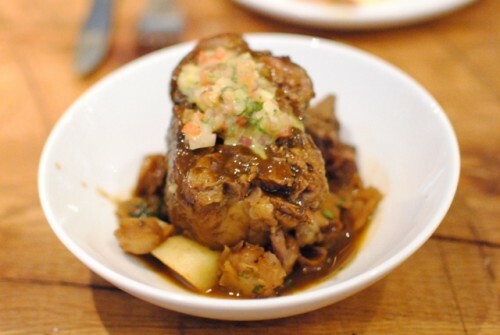 However, the oxtail was served lukewarm (the sauce and potatoes were hot, though). 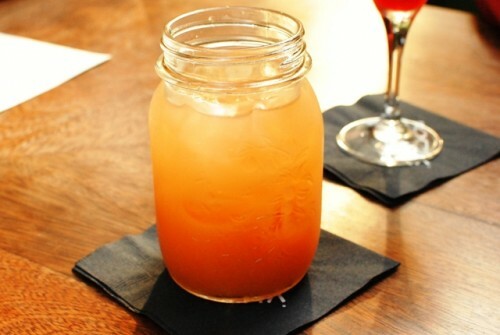 Light and flavorful, with a good pairing with the fresh fruit. 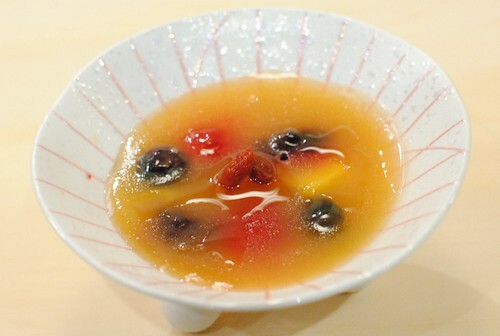 I thought the sweetness of the fruit really went well with the milk-soaked cake. 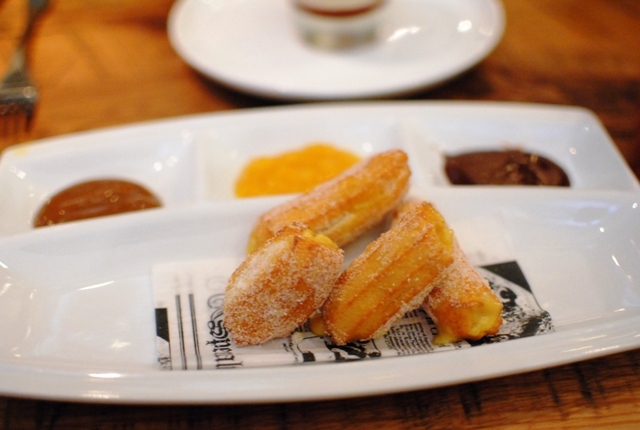 The churros were filled with, I think, a passion fruit filling. Nice. They were served warm, lightly crispy and sweet – exactly what I was looking for. A trio of dipping sauces were available; chocolate was definitely my preferred sauce. 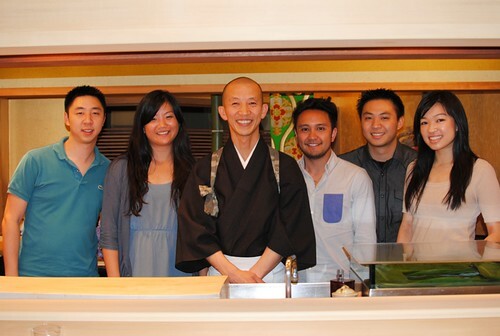 Service was slow and inconsistent (even as soft openings go), which was unfortunate given that the food was a hit. The table next to us actually got up and walked out…I’ve never seen that before. However, I suspect those issues will be ironed out quickly, and the diner’s focus put back onto the food. Even with the diversity of LA, I don’t think many people are really familiar with Peruvian food (myself included). Asian and European influences are both evident in Peruvian fare; maybe that’s why the flavors that Zarate works with taste really familiar. While the ceviche was expectantly good, the causa and anticucho (love meat on a stick!) really shined as well. None of the food disappointed. I’ll likely be back soon to try more of the menu. Given that I work downtown, I’m no stranger to this place. Chaya Downtown is one of my favorite happy hours in the area, largely for its well-priced food and the outdoor patio. 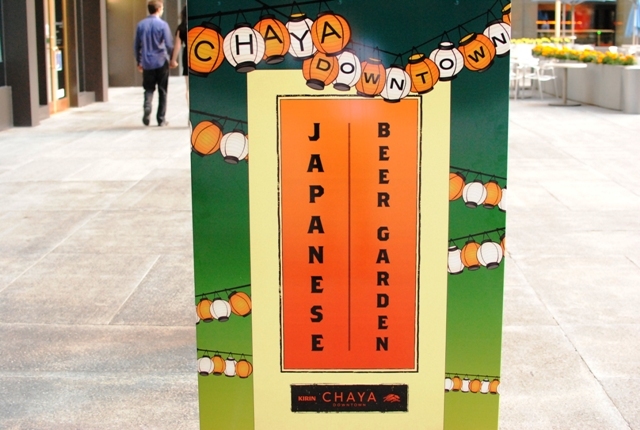 In the summer, they have a ‘Japanese Beer Garden’ theme, featuring yakitori grilled on the patio, as well as a number of other Japanese-inspired dishes. I hadn’t yet had a chance to try it out; so when I was invited to come give it a spin, I couldn’t resist. We started with a couple of drinks. 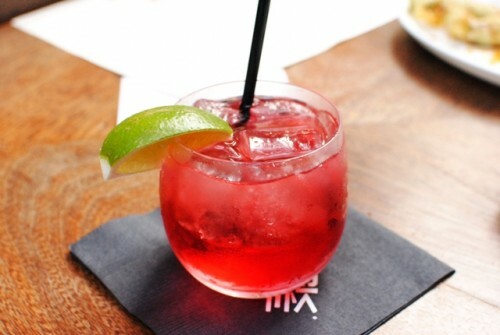 The sangria was pretty refreshing, especially on the outdoor patio. The fruit was evident, as well as a little bit of acid from the citrus. I don’t know my sakes well at all, but I found all three of these to be very drinkable. 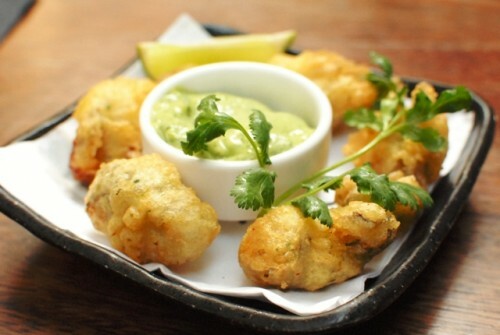 This was the first dish to come out – the oysters were juicy and plump, while the batter was perfectly light. Really nice. Not really something I expected to find at this beer garden, nonetheless it was a tasty ear of corn with a tangy mayo-like sauce. The peppers were pretty mild (thank goodness! 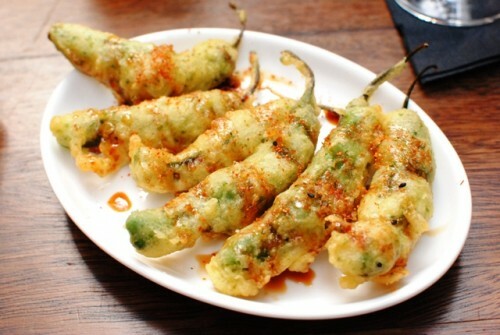 ), fried in a light tempura batter. 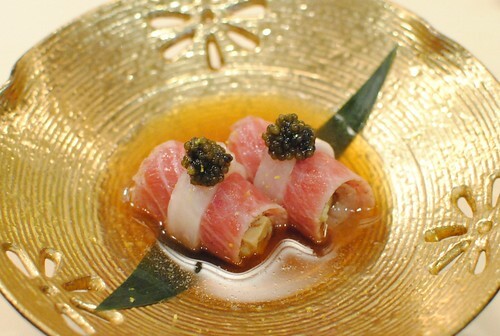 I thought it was a pretty fun vessel for the tuna, while the pepper added an interesting sweet/spicy to the dish. 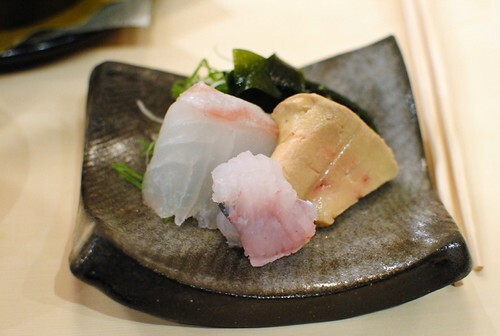 The albacore was pretty tender, while the slight acidity (ponzu?) of the sauce really helped. Nothing really special, but done well. 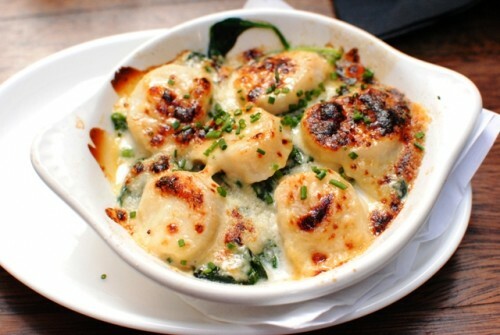 Even though this dish seemed to continue to cook at the table, the scallops were cooked pretty well. The miso provided a rich and creamy sauce – I would’ve liked just a little bit more acidity or citrus to cut through the richness though. 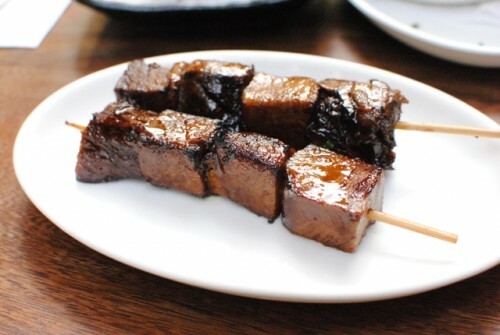 The pork had a nice, sweet glaze on the outside, but I found them to be rather lukewarm on the inside. Unfortunate. My guess is that the restaurant didn’t fully reheat what they had prepared ahead of time, ruining an otherwise tasty dish. All of these were solid variations. 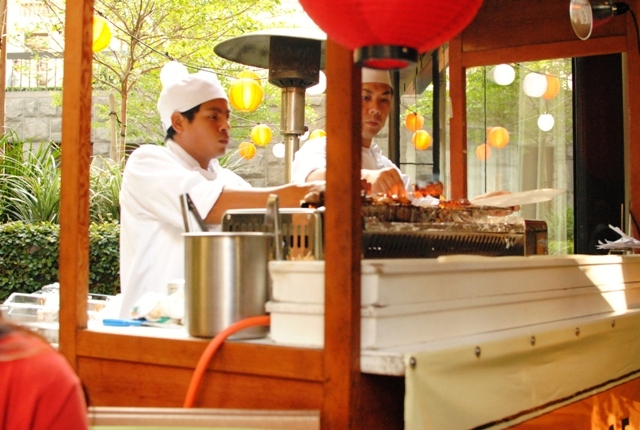 I’d be lying if I said this was akin to some of my favorite yakitori spots in the city, but they were pretty good, especially for the price and in Downtown. 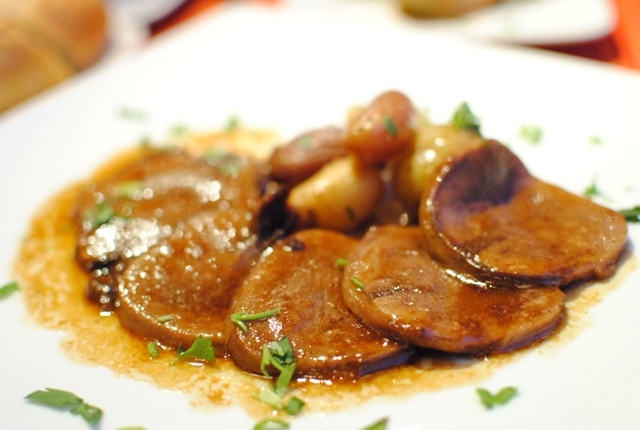 My favorite was probably the beef tongue – tender, meaty, tasty. I was pretty happy with this meal. Over the many visits I’ve had, I’ve found the happy hour service and food to be pretty consistent. One thing to note is that many of the ‘normal’ happy hour items are also really good, including the oysters (seasonal special, $1 a piece) and the fish & chips. The fish & chips is one of the best I’ve had in LA. Seriously. Urasawa was the perfect meal to cap off an already-memorable food week, starting with Taste of the Nation, and including a dinner with Thomas Keller at Bouchon. I love this restaurant, and it’s always my response to people who ask what my favorite restaurant in LA is. I’d been planning a return trip ever since my last visit in September. Even though the price has since climbed to $375 (spurned by the strength of the yen) and worries of radiation persist, it doesn’t look like there’s been a significant slowdown in business. 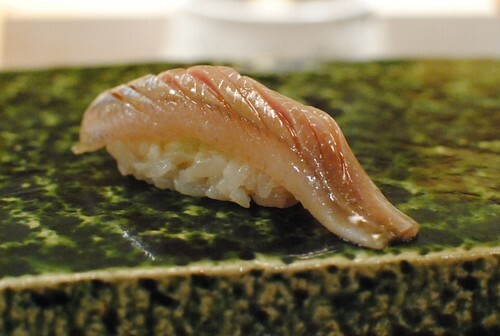 Hiro assured us a couple of times that the Japanese fish he uses comes from the southern part of the country, only. Some varieties come from other places in the world, notably the tuna from Spain. 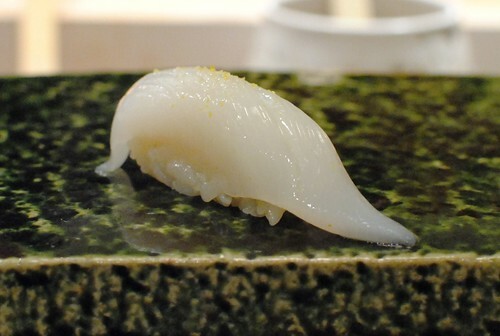 I can’t say I’ve tried a lot of sushi outside of California, but from what I have had, Urasawa clearly stands above the rest. 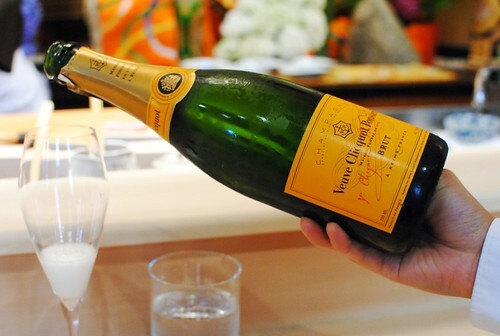 We started with a bottle of NV Veuve Clicquot Brut. 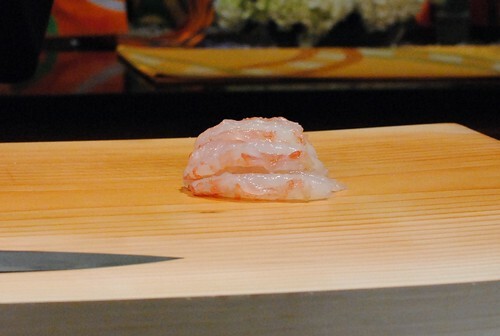 The shrimp was left still raw, leaving a soft spongy texture. 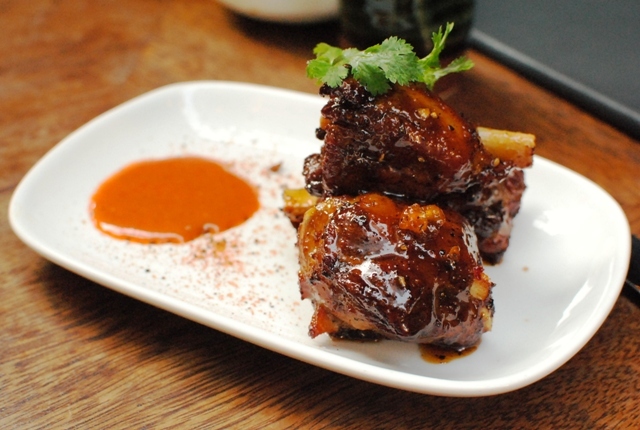 The plum sauce lended both sweet and tart flavors. 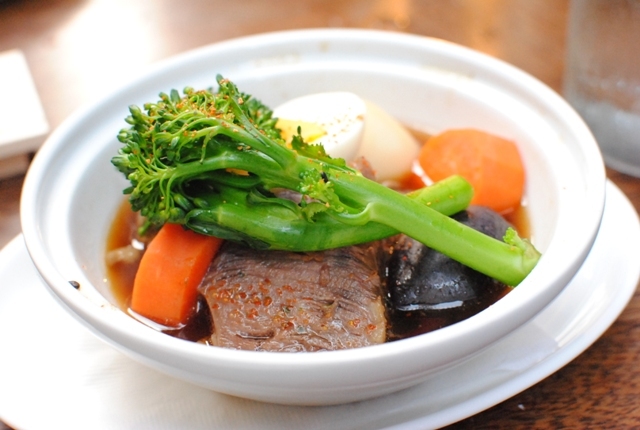 Urasawa always has some rendition of this dish. Some of the best things of the sea are combined with terrific results. 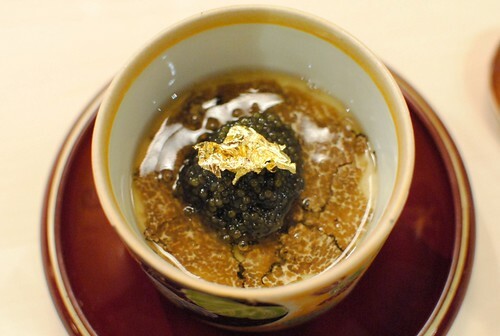 The richness of the liver and toro are complemented by the cool, acidic yuzu and salty caviar. This was a completely new dish for me. 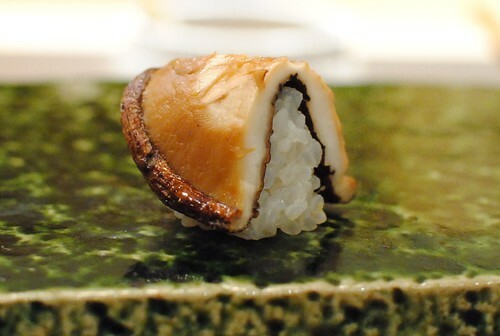 Delicate, with a nice blend of flavors – earthy soy and sesame, as well as bonito and sea urchin from the sea. 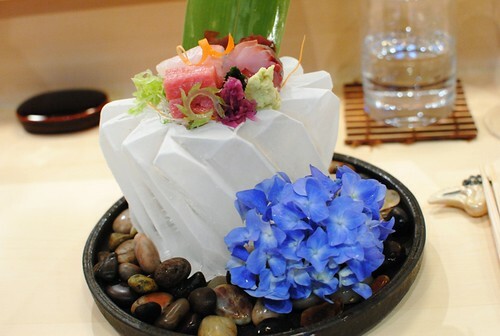 As usual, sashimi comes on carefully crafted ice sculptures, complete with pink or blue flowers (differentiated for male or female diners). 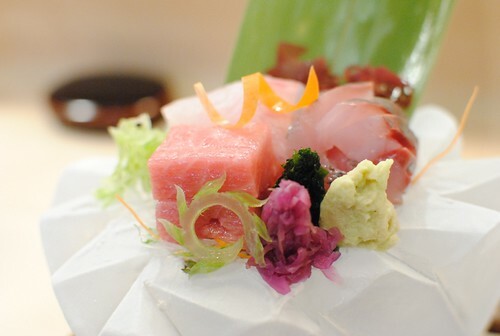 This was the first dish where the quality of fish was at the forefront. Really nice examples of each, with the toro being my favorite. 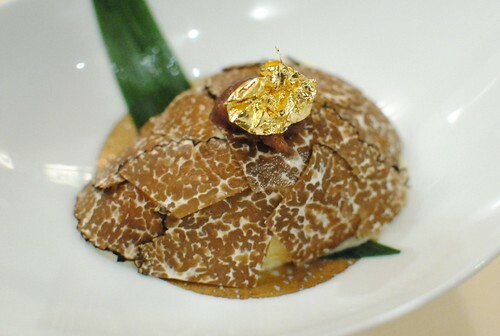 Earth and sea flavors were showcased here, with the truffle and caviar flavors the most prominent. I really liked the silky smooth egg custard too. I was sitting directly below the A/C so I was freezing during the first few dishes. 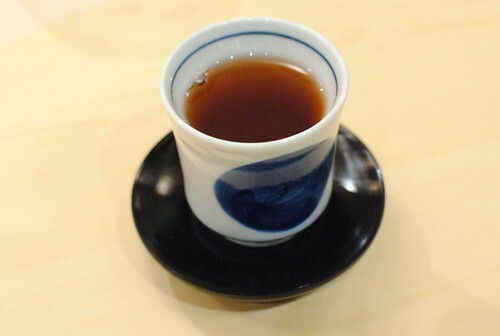 Unlike the water, hot green tea is “free,” so I went to town on this. Here was Urasawa’s version of fried calamari, in a way. 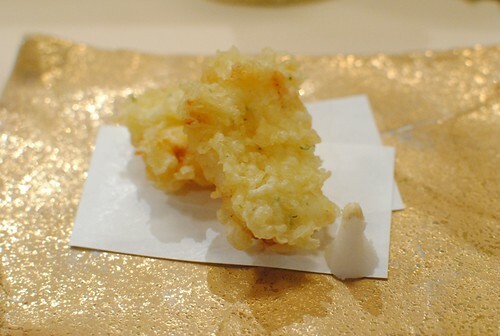 The tempura batter was expectantly light, and the tender piece of squid was delicious. I’m always fearful of food that continues to cook in front of you, as I often find the pieces I eat last have been overcooked. 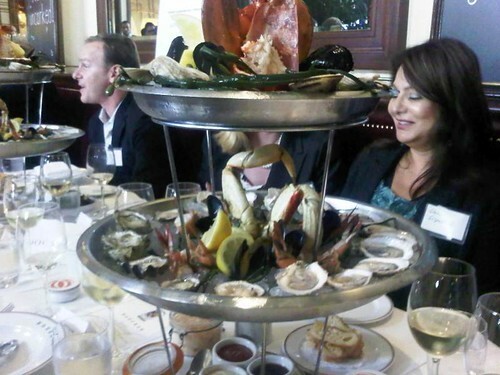 Somehow, that wasn’t a problem here – the seafood was perfectly cooked. 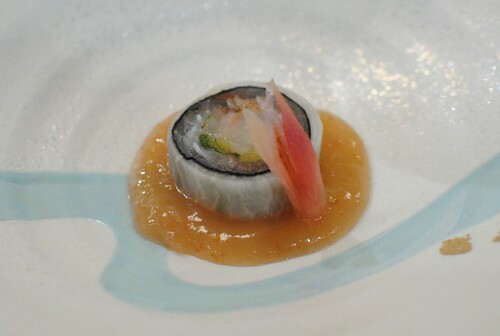 However, I found the delicate fish to be somewhat overwhelmed by the mildly sweet, rich sauce. 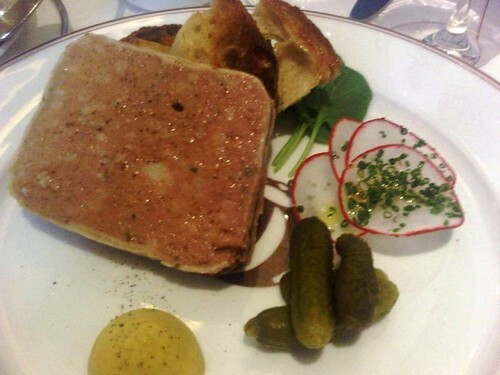 The foie gras was extraordinary. Really…more so than in previous visits for some reason. 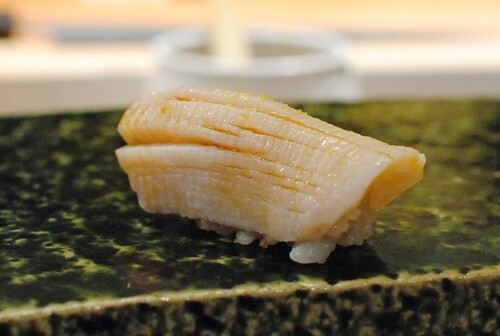 Urasawa also demonstrated that the king eel is actually eaten bone-in, but that he cuts the bone so thinly you can’t tell. Good for calcium, he says. 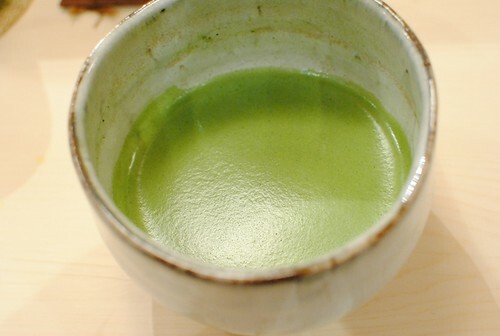 Afterwards, we sipped on the soup we created. 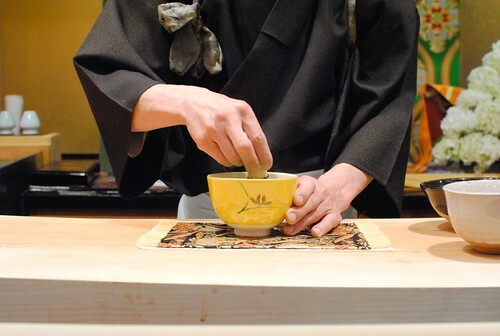 A green plate and a dish of ginger signaled the start of sushi service, made and eaten one at a time. 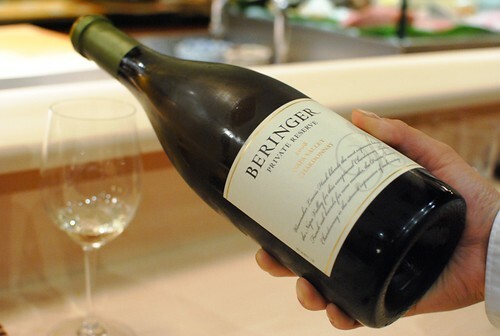 The wine transitioned to a Beringer 2008 Private Reserve Chardonnay. Really liked the upfront oak flavors of this wine, with a sort of vanilla-like finish. 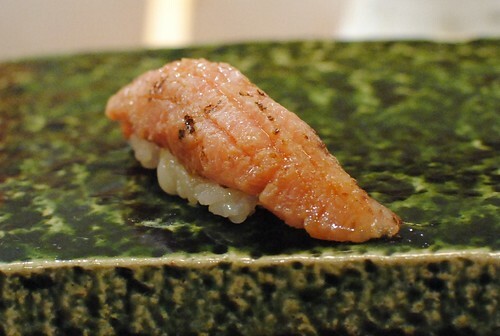 We started with a heavy hitter – Urasawa’s toro is the best Ive ever had. Rich and fatty (the color says it all), it was silky smooth and melted in my mouth. This was similar to the previous, though from the collar portion. Again, really tender with a subtle smoky flavor. 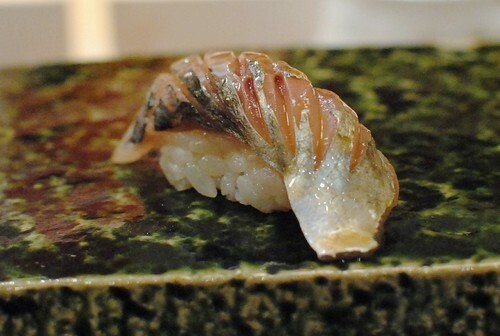 A little bit of resistance in this mackerel, but still tender and flavorful. I thought this red snapper had a brighter, cleaner flavor. Again, teeth not required. A little bit of chew here, and mild in flavor. 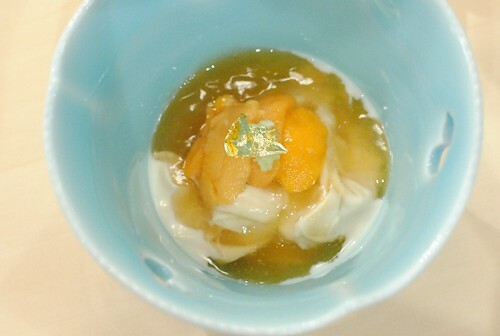 Similar to the tempura version, there was a delicate chew here, and the fish was brightened by some yuzu citrus. I liked the shitake on this visit better than previous ones. Deep, earthy flavor and good change of pace. So good. 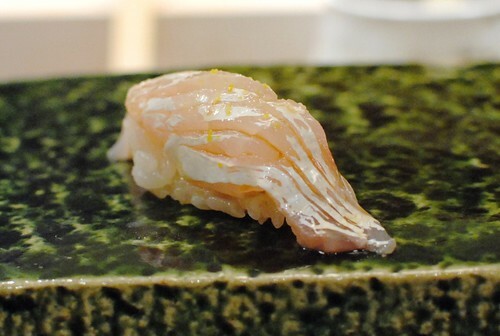 So soft, with a clean sea flavor. 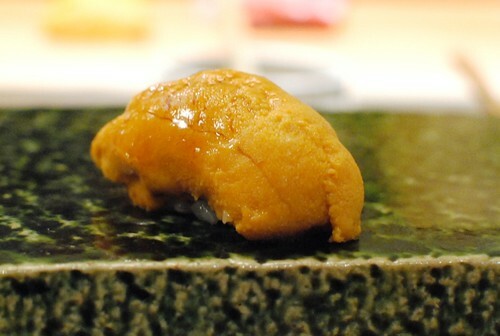 Interestingly, Urasawa used Hokkaido uni for kaiseki dishes, and Santa Barbara uni for sushi preparation. 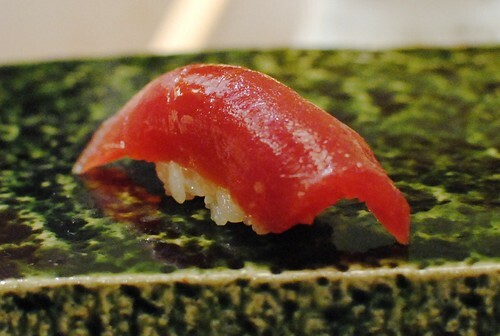 Back to more tuna with some medium-fatty toro. 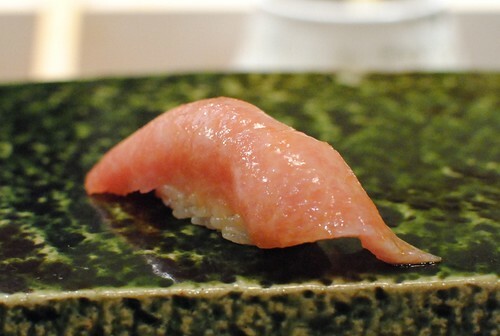 Silky, soft and delicious. Chewy but not overly so, and not fishy at all. 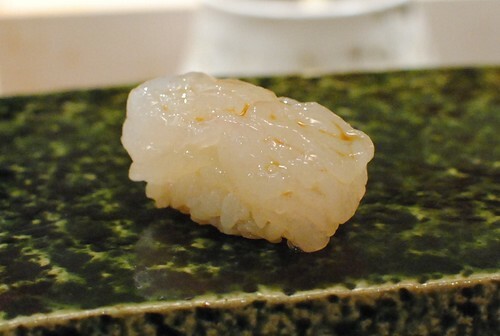 There were probably over a dozen of these small shrimp that make up one piece of nigiri. Soft, sweet, and delicious. 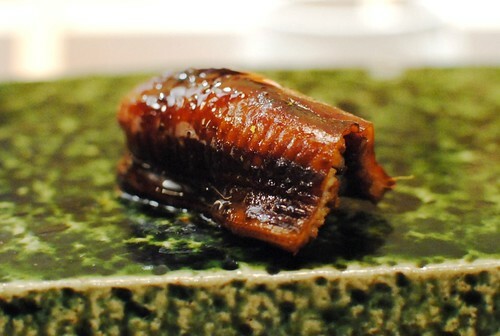 Tender, with a mildly fishy, oily flavor. 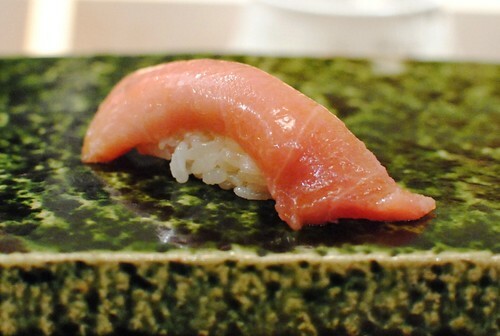 I wish I had a hand roll of this. 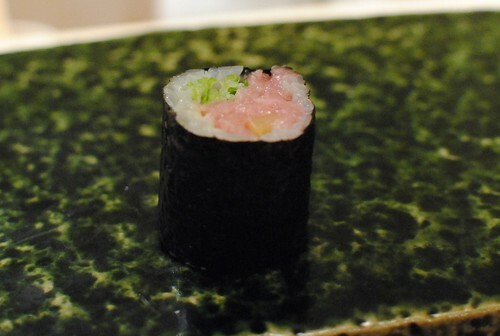 The delicious toro was heightened by some fresh scallion and crunchy radish. 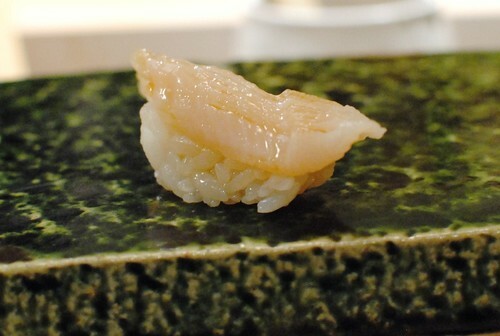 One of my favorite pieces, prepared fresh from the tank. 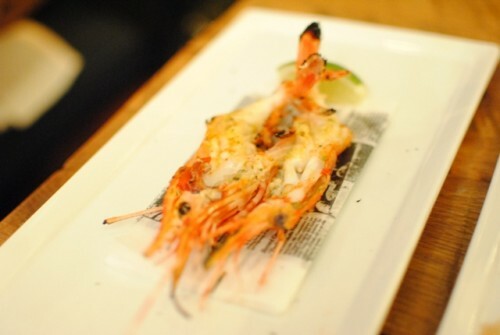 A delightful mouthfeel with these shrimp, chewy and springy and very sweet. A lot of complementary flavors and really tasty. So tender, with a nice rich, sweet sauce. 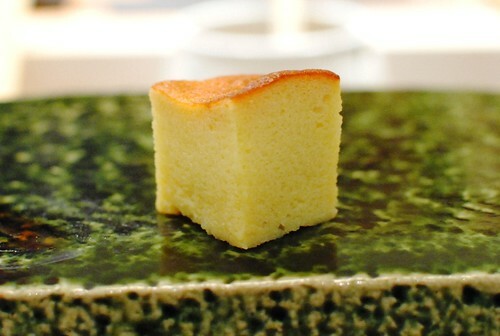 Like a very moist cake, this is a nice transition out of the savory sushi and into dessert. Light, refreshing, and tart. I would have liked something here to be a little bit sweeter, though. Holy crap. Wow. I’d never seen this before, and it was amazing. The rich, creamy nuttiness of the ice cream really paired well with the earthy black truffles, with just a little bit of sweetness from the red bean. 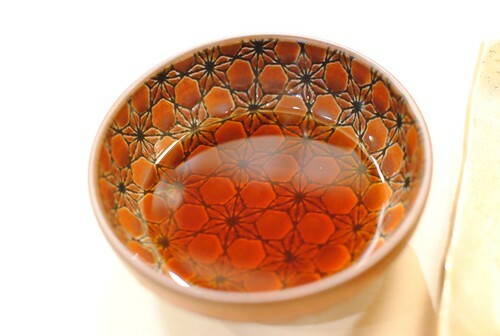 It kind of reminded me of the chocolate sauce that hardens into a shell when it touches ice cream. Except way better. 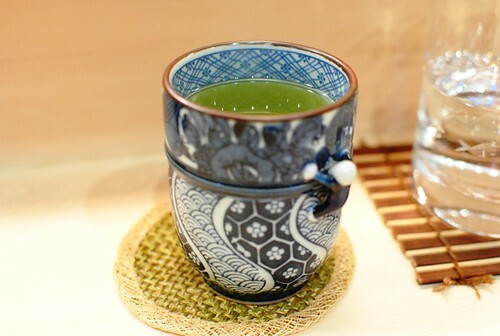 A bowl of bitter matcha green tea was a perfect pairing. 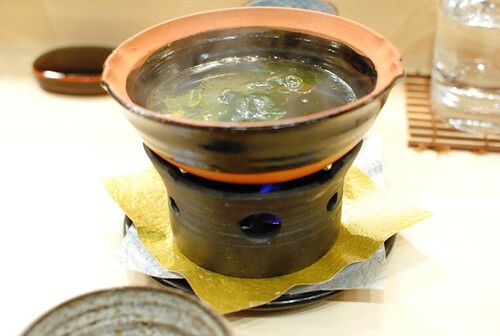 Finally, a roasted green tea to finish off the meal. 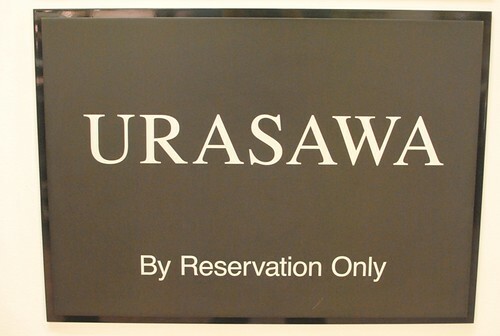 This meal at Urasawa was another fantastic one. Is it worth the money? I think so, at least once in a while. The food is simple and traditional, letting the high quality of the ingredients speak for themselves. Urasawa’s serious dedication to the craft and affable, humorous personality creates a memorable experience in itself. I’m already planning a return visit, hopefully in January for hairy crab season. 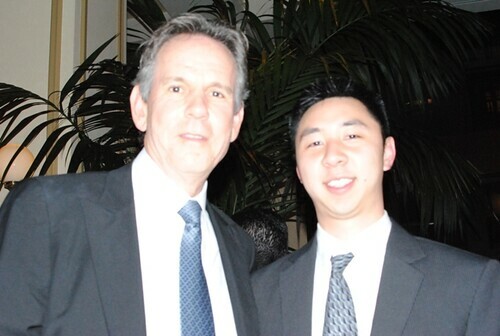 Anyone who knows me (or has read their fair share of posts from this blog) knows that I’m a huge fan of Thomas Keller. Huge. Borderline obsessive. 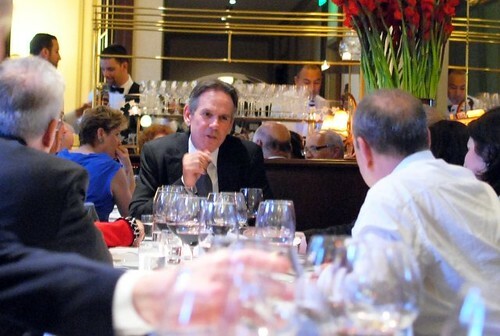 So, when I was invited to a seven-course dinner (with wine pairings) at Bouchon with a chance to sit down and dine with Chef Keller, this was truly an invitation I couldn’t refuse. 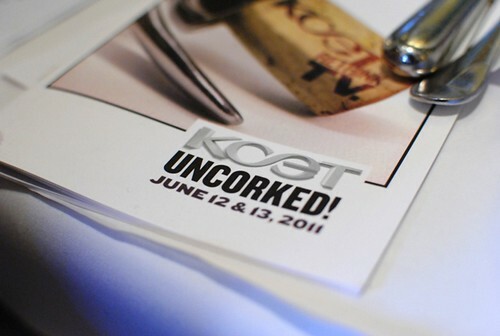 The dinner was a fundraiser for KCET, the public broadcasting network with shows such as America’s Test Kitchen and Simply Ming. The company I work for is a sponsor for the network, and had 4 seats at the $2,500 a plate dinner. Somehow, I got one of the seats. Can I say…best work perk EVER? The benefit dinners spanned two evenings – one catered more towards the public (on the 12th, $250pp) and a more intimate affair (on the 13th, $2,500pp) catered to businesses and other large donors. Due to the nature of the event I didn’t bring my camera in, but I did take some quick shots of the food with my crappy camera phone. However, I did have my camera for the second half of the meal. Before dinner was served, hors d’oeuvres were passed around, consisting of gougères, caviar and smoked trout crostini, some sort of mushroom tarts, and cups of French onion soup. We started off with a few things at the table as the first formal course. A really well-balanced blend of fresh and smoked salmon, this was delicious with the toasted slices of baguette. I don’t often like pates, but I enjoyed this one. Knowing many courses were to come, I abstained from eating too much of it though. 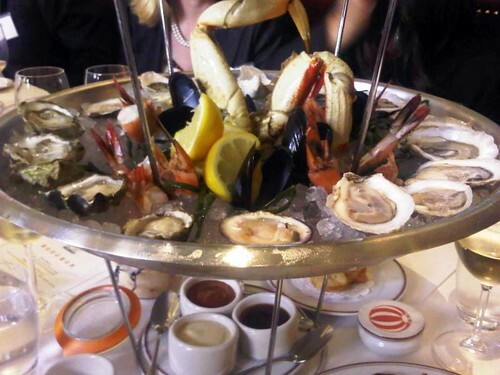 I’m no stranger to Bouchon’s raw seafood bar (see: American Wine & Food Festival), and it’s hard to go wrong with a tower full of ice and fresh seafood. 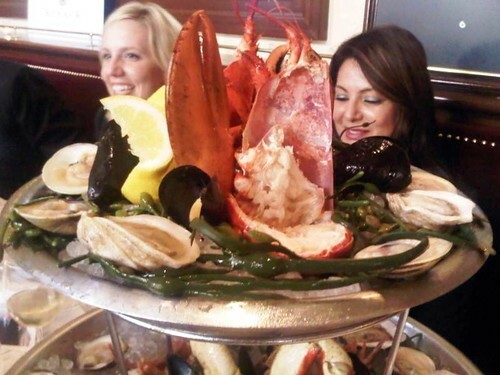 Everything was good; my favorites were the clams and the lobster (particularly the claw). The clams were plump and had a nice chew, while the lobster was really sweet and delicious. Loved it. I enjoyed this salad. It incorporated a couple of in-season ingredients (fennel and apricot), and really came together with the rich ricotta. This was probably my favorite dish of the night. One of the best risottos I’ve ever had was the white truffle version at The French Laundry; while this wasn’t quite on the same level, it was executed just as well. 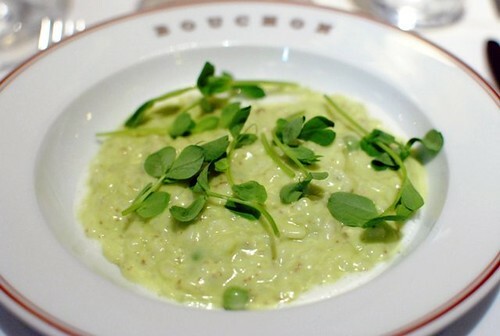 Again, seasonal produce was showcased in the form of the pea and pea shoots, lending a lighter, cleaner flavor to this risotto. Little bits of black summer truffles made the dish extra special. Best way to get my veggies and carbs in one spoonful. 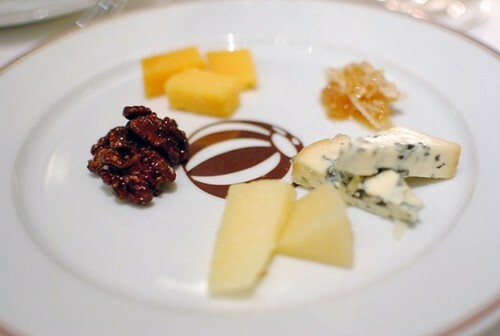 Throughout the meal, Chef Keller moved from table to table, eating one course at each. The lamb was prepared a nice medium-rare, leaving it very tender. I also enjoyed the addition of the morels and fava beans. 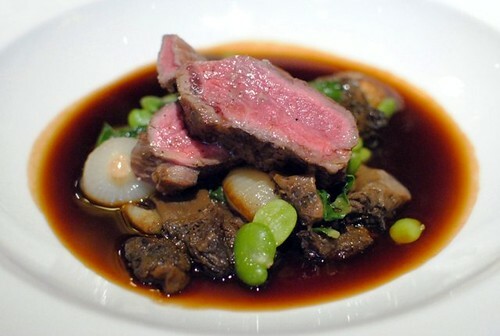 I thought the rich, savory lamb jus really made the difference, bringing everything together. Really enjoyed the syrah with this dish. 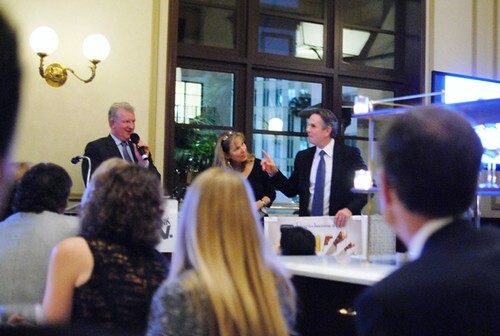 During the cheese course, a live auction was held, featuring trips ranging from across the street (Montage Beverly Hills) to Europe (Monte Carlo). 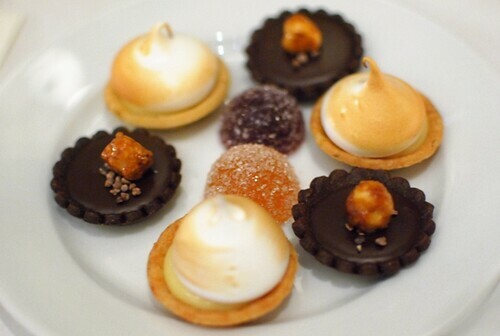 As the savory courses came to an end, two desserts came out. I was a little surprised they didn’t serve their signature chocolate bouchons though. 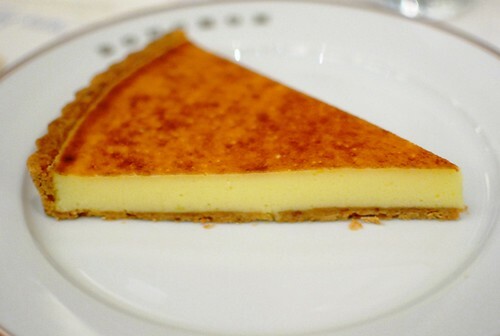 I’m not a huge “sour” person, so I found this lemon tart to be a little bit too sour for me. 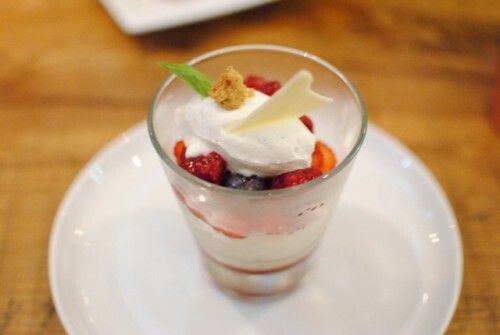 I liked this dessert better…kind of like a marshmallow, but more complex. 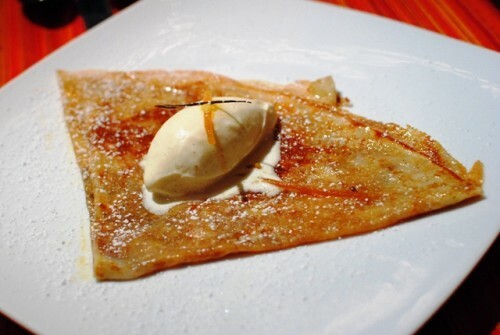 It was light, airy and sweet, with the bulk of the flavor coming from the accompanying vanilla creme anglaise. 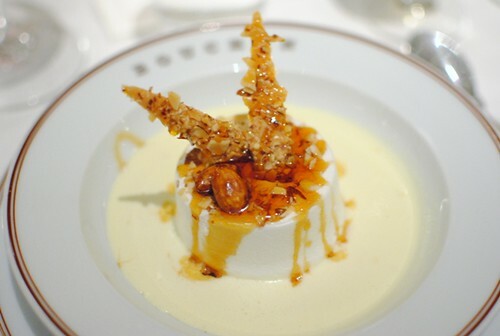 I thought the almonds and caramel worked really well with this dessert. Of course, we had the requisite kitchen tour. I knew coming into this dinner (experience) that I’d probably remember it for the rest of my life. After all, being able to meet and spend some time with Chef Keller was such a unique opportunity for me. I would have to say he was a little less easygoing than in prior meetings, but it was still very cool to spend some time with him. 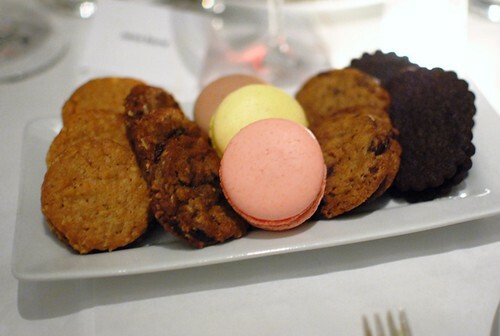 As for the food, I would call it an excellent Bouchon dinner. I was hoping the food would have glimpses of the cuisine at the French Laundry level, but that wasn’t the case here. 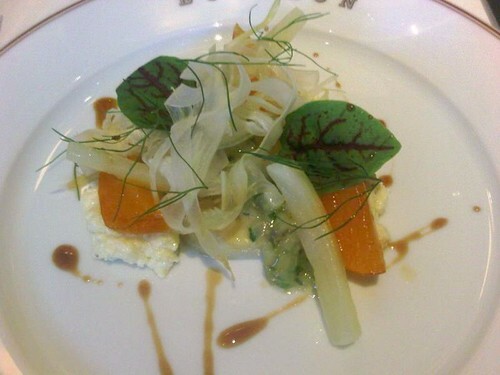 Still, similar to previous Bouchon experiences, the dishes were really well-executed and pretty delicious.